Labour Chief advises companies on increasing productivity. Straits Times. THE productivity of workers in Singapore is declining and labour chief Lim Swee Say has a suggestion on how companies can help turn it around. It is by doing more to develop new markets for their products. He made the call to companies on Friday in response to feedback from many of them that measures like the Jobs Credit wage subsidy scheme are to be blamed. Such government aid has resulted in these companies holding on to more workers than they need. They had noted that when 10 workers are retained to do the job of eight or nine workers, short-term productivity suffers. Mr Lim, however, felt that the Government was doing the right thing by introducing help measures to save jobs. To get around the short-term impact on labour productivity, which is a measure of the output per worker, he urged companies to ‘find ways to prepare these 10 workers, so that by the time the upturn comes, (they) can produce the output of 11 to 12 workers’. Among the things companies can do to prepare the workers are to develop new technology and design innovative products and services, he said. Also, they could find new markets and generate more revenue from existing markets, he suggested. Mr Lim, secretary-general of the National Trades Union Congress, gave these ideas at NTUC’s first National Day observance ceremony at its headquarters in One Marina Boulevard. 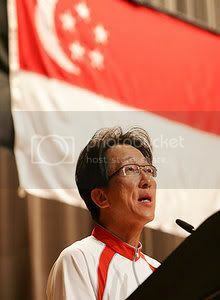 His comments come amid official concern with Singapore’s labour productivity, which has been falling since late 2007. It has dropped by 15.4 per cent in the first three months of this year compared to the same period last year. Workers too can do their part and Mr Lim, who is also Minister in the Prime Minister’s Office, reminded them yet again to improve their skills and be more adaptable than those in other countries.